As you read this bear in mind that I’m not condemning Toya Graham, the woman seen in a viral video smacking her 16-year old son after she spotted him rioting in Baltimore. Instead, I’m condemning a system of oppression that colonizes us to the point that we will brutalize our children to keep them safe from the police and out of jail. This is not about respect for the rule of law but about fear and submission. Our communities are taught that if we want to survive, if we want to live another day, we must submit and keep our heads down. Mind you, I’m not advocating for violent protests either. I think they are counter-productive and are usually used by those in power to discredit legitimate causes and issues. 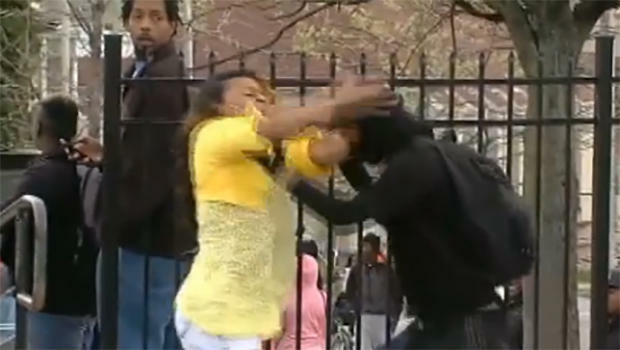 But much of the media has dismissed the rioters as “thugs.” Conservative outlets and comments on social media immediately blamed single mothers, the ghetto culture and all the usual suspects for the violence in Baltimore. That attitude keeps us from seeing the structural conditions fueling all this anger and the feelings of helplessness so prevalent among our youth. We label them “thugs” and that free us from dealing with the issue at hand which is that Blacks and Latinos are more likely to end up in jail or to be killed by the police than whites. Black and Latino are likely not to survive an encounter with the police- even after being arrested. As reported by Mother Jones, a Justice Department’s Bureau of Justice Statistics reported “that between 2003 and 2009 there were more than 2,900 arrest-related deaths involving law enforcement.” And a “rough calculation based on its data shows that black people were about four times as likely to die in custody or while being arrested than whites.” Latinos/Hispanics were twice as likely as whites to die while in custody or during arrest. I can understand the fear of parents like Toya Graham. As she commented to CBS, after seeing her son wearing a hoodie and mask, “I just lost it,” “I was shocked, I was angry, because you never want to see your child out there doing that.” She added: “That’s my only son and at the end of the day I don’t want him to be a Freddie Gray.” Graham was referencing the 25-year-old man who died after sustaining severe spinal injuries in police custody earlier in the month. His death sparked the protests in Baltimore- which started, and for the most part have been peacefully. Her comments illustrate the reality of many Black and Latino communities. Do other communities need to teach their children “How to survive an encounter with the police?” Do other parents fear that roughly every 28 hours someone who looks like their children will be killed by the police? “Don’t give them an excuse to kill them.” Let that sink in for a minute. I understand the feeling. We have to be practical and do whatever we need to do to protect our children from the state. But it is this how we want our children to grow up, fearing the police, and entity whose only purpose should be to serve and protect the people? At what moment does our practical approach help to perpetuate a system of oppression? While some go for the “how to survive talk” others, instead visit violence upon their own children to make sure they will not get in trouble with the police. The latter is rampant is we are to judge by the comments and memes in social media. We have tried these approaches for decades, yet our children continue to die. So why do we continue to vouch for this approach to raising our kids? Why do we perpetuate the cycle of violence? It does not work, it will not work. 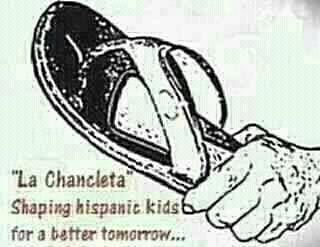 A Cosmopolitan article titled “18 Ways You Know You Grew Up Puerto Rican” lists “Being constantly afraid of the chancleta. And when your mom said, “Wait until your dad gets home,” you knew things were serious” as sure signs that you grew up Puerto Rican. A Facebook meme show a hand holding a belt with the caption: “How many [people] it has put on the good path” or “How many [people] it has fixed.” Other Puerto Rican memes show the methods of discipline, a stick (la varita), the famous chancleta, and the belt (la correa) used by our grandparents (and parents) for the slightest infraction. That one in particular dismisses therapy, negotiation and communication and ends up by stating- that society “back then” was marked by respect and peacefulness. Yeah right. So we are to believe that Black and Latinos who end up in jail- or killed by the police, were not beaten enough or in time by their parents. Is it just me or does this sound like the greatest oxymoron ever? With much insight, Graham told CBS News that the situation “wouldn’t have been as bad if there were more mothers out there monitoring their sons.” She is right. More mothers, and fathers, should’ve been there but marching and supporting their children, demanding that they are treated with respect, protecting them from the police, demanding accountability. Yet, just like many other Black and Latino parents Toya Graham felt she only had one option to protect her kid. She had to be tough and even brutal with her kid to keep him from harm. When we do this we are taking on the role of a brutalizing state. The police become unnecessary as we assimilate their methods and apply them to our own children. When we do this we are not teaching our children about respect but to be afraid. We are telling them to fear authority not to respect it. We are teaching them to keep their heads down, to comply, comply, and comply. What about teaching them about their value as human beings, that they deserve respect, that their lives matter?